An Ancient Solar System...: Answers for Authors: Could a stranded astronaut really grow food? Answers for Authors: Could a stranded astronaut really grow food? In fact, the future of salad in space looks multi-coloured, crunchy, and even good enough to protect against the space crazies. I mean... I'm not saying they might not prefer rare steak. But stuffing a cow into a rocket isn't easy. 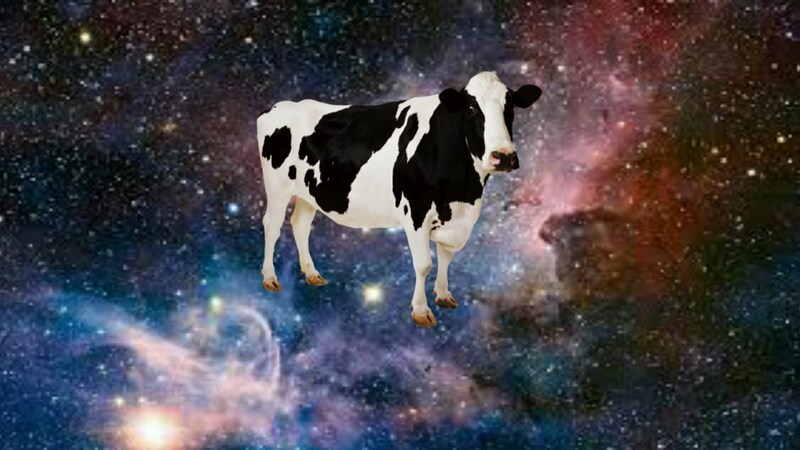 Disclaimer: Not a real space cow. Nor would mucking one out be, although sending living things into space to see what weird things happen to them is a long and horrifying tradition. In fact it's how the story of fruit and veg in space begins: America was shooting seeds of maize, rye and cotton above the atmosphere, well before NASA came along, on V2 rockets capture from Nazi Germany. Above: All the space critters, courtesy of Space.com. ...but plant seeds were actually the starting point - you don’t need to put anything very complicated or expensive in the rocket to monitor what happens to them, just see if they grow when they get back to Earth. Slightly to everyone’s surprise, seeds sent into space grew perfectly normally*, and sending seeds was established as a cheap and simple way to test a destination. When Apollo 14 went to the Moon Loblolly Pine, Sycamore, Sweetgum, Redwood, and Douglas Fir seeds went along. They were planted back on Earth, to see if being on the Moon had done them any damage: It hadn’t. Well… actually, yes: Seeing how fucked up plants get without gravity is a genuinely useful way to find out more about them. It’s using a change in gravity - something that's hard to do properly here on Earth** - to investigate plant biology, growth, and development. After a years of nagging, the Soviet Salyut 7 space station crew grew some Arabidopsis plants in microgravity - they flowered, and the idea caught on: An experiment on the US Skylab spacestation studied the effects of gravity and light on rice plants, the SVET-2 Space Greenhouse successfully achieved seed to seed plant growth in 1997 aboard space station Mir, the Bion 5 satellite carried Daucus carota, Bion 7 carried corn.... and so on. 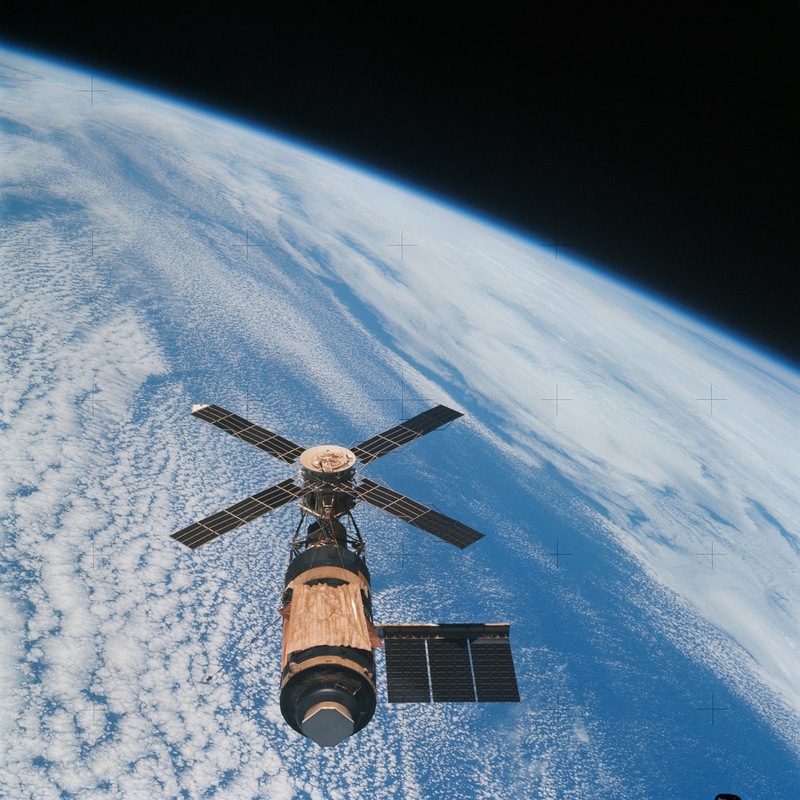 Above: The Skylab space station. Courtesy of NASA. Once the first plants had flown more things to research became apparent. Microgravity makes it easier for plants to move – plants move on Earth (just jump on youtube ad look for videos of plant movements following the Sun over the course of a day), but microgravity allows movements too small to be noticed on Earth to show up, revealing things about plants circulatory systems and some movements we don’t understand the meaning of yet. Microgravity also influences how water moves through the soil – insead of flowing downwards it gathers close to the entry point, turning some parts of the soil into watery slurry, and leaving others parched. Plant research continued on the International Space Station, using flowers grown on a nutrient-rich gel in clear petri plates. That’s not just to make it all more sci-fi, the idea was to watch how the roots grew. We know that plants generally do sense gravity, and that’s why they know to send roots down and shoots up. To do this they use starchy structures called amyloplasts – these are denser than the cytoplasm (jelly stuff inside the cell) so they sink to the bottom of the cell under gravity, giving it an idea of which way to grow. Yet plants with fewer of them still figure out up and down eventually – so even on Earth we know sensing gravity isn’t the whole story. The space flowers confirm this: They showed growth patterns thought to be gravity dependant, so it seems that some plants can read other indicators to which way their shoots and roots should grow. Some plants definitely don’t like space as much as others: Their roots grow in the wrong direction without gravity, and the second generation of canola seeds grown aboard the International Space Station were pretty sickly. Potatoes grew the same in space as they do on Earth, as do many others, but lack of gravity also works on plants in indirect ways: like humans they need constant ventilation, or they could end up suffocating in a bubble of their own waste gasses. How are those plants that thrive doing so? The alternative cues they follow include moisture, nutrients, and light: A study of how the plant’s use various kinds of genes –in microgravity backs that idea: The University of Florida grew the A. thaliana plant on the ISS, and found that plants in microgravity used ‘adaptive strategies’ - like increasing their expression of genes associated with light perception in the leaves. Understanding those strategies could help us to create strains specifically adapted to space, but (in an uncharacteristic move of co-operation by mother nature) many plants seem to find solutions themselves. All this experimentation has born fruit (or at least tomatoes, which I'm still confused about): An experiment snappily named ‘Biomass Production System’ was used on the ISS, and later the VEGGIE system (Vegetable Production System). Plants tested in VEGGIE included lettuce, Swiss chard, radishes, Chinese cabbage and peas. 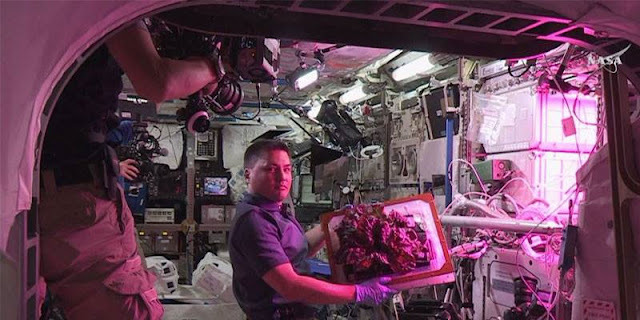 American astronauts first ate plants grown in space on August 10, 2015 when their crop of Red Romaine was harvested. Above: The ISS crew harvesting crops from the station's greenhouse. Although Russian cosmonauts have been eating their own crop since 2003, so presumably the Russian word for ‘sissies’ may have been muttered through mouthfuls of lettuce and salad. For several years. OK, that’s on a space station, in a nutrient gel. True colonies are another story, though. If off-Earth colonies want to grow, or if they can’t recycle every last atom of waste, they'll need additional nutrients. So will Lunar soil, for example, support plants? On the face of it, the Moon isn’t a great farming prospect. The utter lack of air is a wee bit of a problem – but if we domed over a section, melted some lunar ice, and filled the dome with atmosphere… would we get crops, or just damp dust? Well NASA provides a lesson plan (here), so you can do some experiments yourself. Because life is based on four main chemical elements: Carbon, Hydrogen, Oxygen and Nitrogen (CHON). In Earth soils these are abundant as organic matter. But the soils of the Moon and Mars are very poor in organic matter, as their soil is essentially ground up rock. So where are these plants getting their CHON from? It turns out that many species of plant simply don’t need their CHON as organic matter. The right bacteria in the soil can extract those elements from the rock particles, which have CHON in them as chemically bound compounds. The plants then feed off the bacteria. For example, plants need nitrogen in it's reactive form - and the missing reactive nitrogen could be made by using ‘nitrogen fixing’ plants and bacteria. So to make Lunar soil fertile we may just need to add a sprinkling of microbes. We'll have to wait for future missions to see if the plants hold up on real alien soils - possibly more of a worry would be the heavy metal content of both soils - metals like aluminium and chromium that damage plant growth. These could be cleaned out in any number of ways, but it adds a layer of difficulty. There’s more to the soil story: The Moon and Mars don't have the most fertile soils off Earth, the asteroids do. Specifically, carbonaceous or “c-type” asteroids, which are packed with organic compounds and highly nutritious for plants. Michael Mautner, of Lincoln University in New Zealand, came up with a very direct way to test that: He grew edible plants in material from c-type asteroids, which had fallen to Earth as meteorites. He simply ground up the meteorite, added water, and seeds, and waited. Then he did something scientists don’t do often: He ate his results. While he was waiting his space salad to grow he also analysed the nutrient content of these meteorites, and calculated that a 200-kilometre-wide space rock could provide enough fertiliser to sustain 10,000 people for a billion years. That's pretty incredible, and the really good news is that asteroids are tiny, low gravity, places. Most of them you could jump right off of so mining their fertile soil, or shipping crops grown on one, shouldn’t be a problem. Michael Mautner got a meal from space, and a potentially revolutionary scientific result - just for doing a bit of gardening. Not bad for grinding up some rocks. 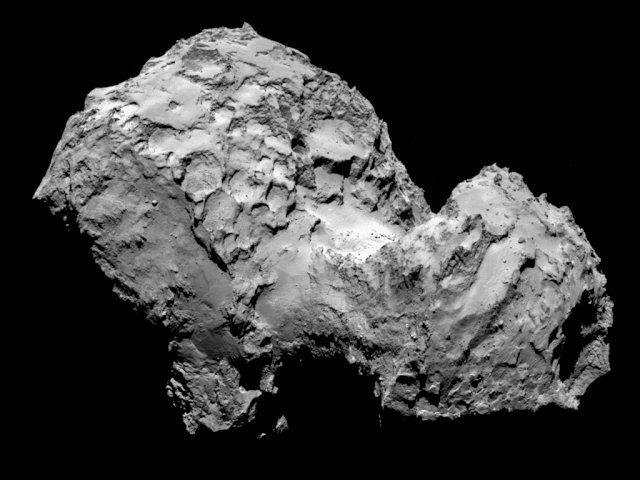 Above: Comet 67-P, as seen by ESA's Rosetta space probe. True it looks like a gigantic flying poo, but, being loaded with both water (as ice) and organic molecules we could be looking at prime farming real estate. "It was surprising to me how great soybean plants looked," NASA astronaut Peggy Whitson wrote in one of her Letters Home while she was aboard the space station. "I guess seeing something green for the first time in a month and a half had a real effect. I think it's interesting that my reaction was as dramatic as it was." Given the psychological dangers of space – the effects of extreme isolation, monotony, boredom, and space radiation induced dementia - a space garden seems like a very good idea. 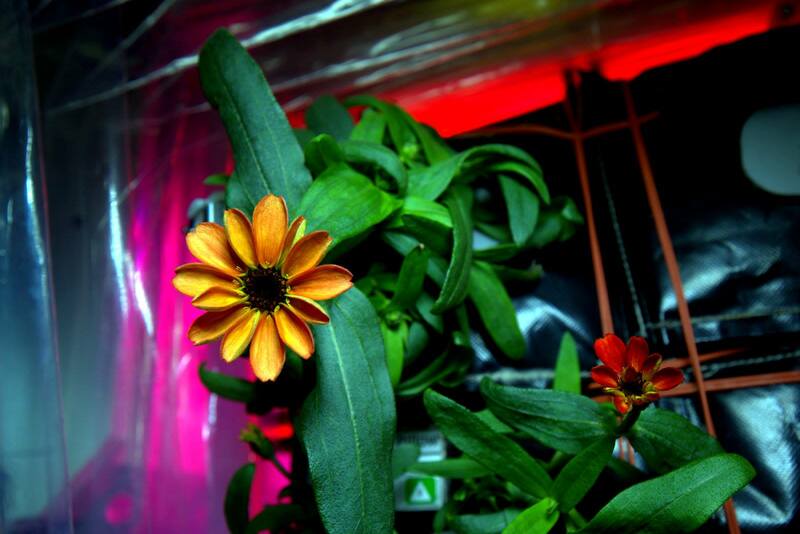 Above: The first ever Zinnia in space. It's probably confused. Are there any unknowns? Yes, plenty - the biggest thing we haven’t yet really tested is the effects of reduced gravity. That seems like and odd worry, considering how we’re able to get plants to grow with no gravity at all, but the devil is often in the details – what if by some quirk of biology there’s a ‘black zone’ around 1/6th G (the surface gravity of the Moon) which plants really don’t like? NASA has plans to test that by just sending plants there and just... seeing how they grow. 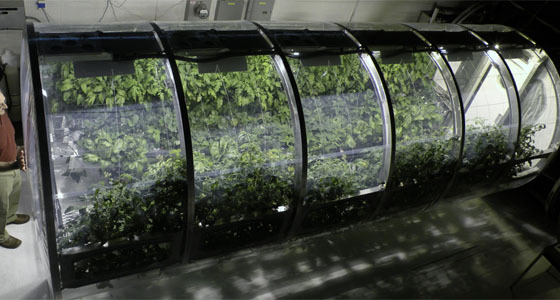 Could a lone astronaut grow enough food to live on? Maybe - a lot would depend on where they were, and their exact circumstances. But, as far as growing crops in space generally goes.... I'd have to say yes. In fact, in the long run, it's hard to see how astronauts will be able to avoid it. * A disaster for animal rights, as that meant the animals were up next. **On Earth changing gravity is pretty difficult – we have centrifuges but keeping a pant growing inside a spinning centrifuge for months on end isn’t easy – and the plant still has Earth’s gravity acting on it. Devices called clinostats can be used to spread gravity’s effects across all possible directions, but that isn’t exactly the same as taking gravity away.